British canoeist Tim Brabants just missed out on an historic double at the World Championships in Duisburg. 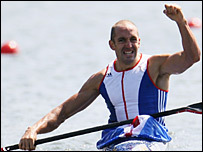 The 30-year-old was hoping to become the first Briton to complete the K1 500m-1000m double since 1987. But after winning the 1000m on Saturday, the Surrey paddler was pipped by Canada's Adam Koeverden in the 500m. Brabants, who will compete in both events at next year's Beijing Olympics, said Saturday's win marked "the best race of my life so far".